Avatar: The Journey | Phil-zine! I will be talking about plot in this post more than in my last. So if you want the initial reaction to the film, which hasn’t changed (only become stronger), go to my previous post. 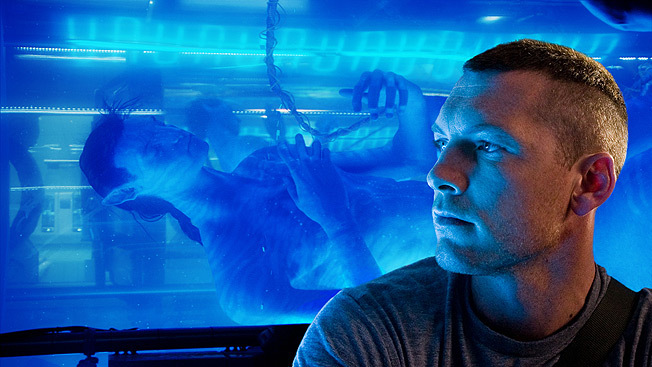 For Avatar, James Cameron has plugged his leading soldier Jake Sully, a good hero’s name without being brazen, directly into the Hero’s Journey. Like a chord into an outlet its the energy that makes this bulb glow. The first shot of the film we see is Jake, played by a wonderful Sam Worthington, waking in what could very well appear to be a womb. He’s surrounded by liquid. He’s essentially being born for the audience. This is the man who’s story we’re about to follow. We get brief flashbacks of how he got there, which wouldn’t be necessary, but Cameron decides to show us his brother rather than just tell us about him. Good choice. His twin brother was a scientist (now dead) and the only way the Company at the center of funding the Avatars, blue replicas of creatures, Na’vi, that inhabit the planet Pandora, can save some money is to place Jake in his dead brother’s Avatar and under the command of Dr. Grace Augustine, and if you squint hard enough you can see Lt. Ripley peek through Sigourney Weaver’s graceful aging. The reason for all this is so that the Company can attempt to get to a resource that’s housed under the Na’vi’s giant religious tree. Jake is a jarhead. He knows nothing about the culture he’s about to step into. He’s ambivalent to them, in fact. So every step deeper into this new world is not only our first, but his first. And what makes it work so well, is that with each new unimaginable experience Jake has an equally strong reaction. This is the first time he’s tested an Avatar. We get to experience Jake using his legs for the first time in the film, which is a surprising emotional moment. You feel the joy he does. The feeling of freedom. That first step to a much larger freedom. As the film continues the playful sense of joy is sprinkled in as Jake interacts with the new world around him on Pandora. And as he is brought into the Na’vi community Neytiri, a very blue Zoe Saldana (who between Star Trek and this must really be enjoying her new fame), his ambivalence grows into understanding and eventually respect and finally love. The line repeated throughout the film “I see you”, is simple yet staggering on all the levels it manages to work. There are two key points for me in the film that truly point to his growth, and the power of the Hero’s Journey at use, and also the tricky layers that are at play in Cameron’s script. While the story is simple, the decision Jake has to make is complicated. He’s not just choosing between two worlds, he’s choosing between two completely different ideals. And that difficulty is felt even more because we’re living in a culture in which it’s very difficult to see the humanity behind cultures that are completely foreign to us and some of which are even threatening. The second book in the Ender’s series Speaker for the Dead is an excellent companion to Avatar in this regard, and far more complex in the dynamics and how they relate to our current situations (and actually Avatar is more a rip off of this book than any other source! I’ll be nice and say inspired by.) But we’re not looking for complexity in this situation, we’re looking for honesty. First it was the physical freedom of stepping into the Avatar for the first time. A nice physical and metaphorical touch. The second is when Jake talks to his superior on the military side of things, Colonel Miles Quaritch, a great Stephen Lang, for the final time before the story elevates into the third act, Jake can’t hide his enthusiasm for becoming a man in the clan of Na’vi. He tries to make it sound like the sole purpose is so he can finally gain the clan’s trust and get them to move from their tree so the Company can make a lot of “cheese” (Giovanni Ribisi is great), but he fails miserably. His love for this culture seeps through his every word. Watching him eat his scrambled eggs so quickly is a wonderful moment, showing his desire to be with his new love again. Moments like this make me baffled at people’s reaction to the supposedly not very good story. It’s in the details. And the final step of this journey is the final moment of the film, when Cameron mirrors the very opening shot. Jake Sully is being reborn as Jakesully. And while we’re not given much of Jake’s past, we can see a future we only wish we could continue to follow along with. This entry was posted on December 24, 2009 at 8:39 pm and is filed under Current Movies and Reviews. You can follow any responses to this entry through the RSS 2.0 feed. You can leave a response, or trackback from your own site. Nice review. I never thought much about that scene where Sully is rushing to eat his breakfast. All I was concerned about at the time was his avatar not being run over by the darn bulldozer. Haha! Very astute observations. Cheers! Heh. As a writer my first thought was “How is he going to get him back there in a believable fashion?” Not only was it believable, but really quite truthful. Someone would want to get back to their lover right away. In that situation, I certainly would!